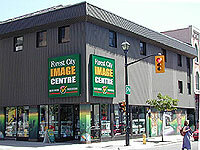 Camera Canada is the electronic commerce arm of Forest City Image Centre. We are extremely proud of the reputation we have earned over the past 28 years in the Canadian photographic marketplace. Every one of our industrial staff have received training from our Canadian suppliers and they are as up to date as anybody in the industry. It's pretty much a store policy that if we don't know the answer to something photographic, we'll find it! We're also not afraid to give opinions ... after all, that's why you buy from us rather than a Big Box retailer who just doesn't "get it"! We do not work on commission and we do not allow manufacturer's spiffs to sway our product suggestions. When we say we like a camera ... we like it! Our commitment to customer service is second to none. At Camera Canada, service and knowledge are what sets us apart from everyone else. Any store can sell a camera, a lens and a tripod, but how many can tell you why it will or will not work for you? Our staff is told to do one thing - help the customer! It is not uncommon to see one of our staff trying to take a customer out of a higher priced product and into something that is more appropriate (why buy a $1400 digital camera when a $499 one will suit your purpose better?). Unlike many other retail stores, our sales staff do not see dollar signs when someone walks into the store. Camera Canada staff do not, will not, never will, work on commission nor are they expected to sell "X" number of dollars per week. Their only job is to help the customer. We firmly believe in offering our customer a fair and equitable price from the start ... no deals, no hidden offers. Many retailers inflate their prices so they can "negotiate" down to the selling price that is actually fair, thus giving the impression of offing to "deal" their price. This is misleading and unethical in our opinion and is not something we believe in. In some cases, Camera Canada is forced to advertise products at the manufacturer’s MAP – Minimum Advertised Price. Obviously this hampers our ability to offer good value to Canadian consumers. It is not uncommon for customers to ask about product bundles in certain cases. We believe in supporting Canada and to that end, we buy ONLY from authorized Canadian suppliers and we try to compete with large Canadian & US internet companies fairly and aggressively. Low price is something we strive to maintain, yet there are times that our competition will lower a price before we catch it or we simply 'goof' and price an item too high. The absolute lowest price is impossible to maintain, as there are always stores that monitor retail pricing (like ourselves) or are desperate for cash flow and will undercut anyone just to make a quick buck. Bear in mind that these types of practices do not lend themselves to a long-term commitment toward the customer and the store may not be around long enough to help if there is ever a need for service or assistance. We will almost always* match a competitor's price on any IN STOCK item that is not end-of-line. This 'in stock' policy is to combat the many stores that entice customers to shop at their store by offering ridiculous pricing on an item that is available in limited quantities and in some cases, these stores do not even have the item, at all. (Anyone can offer a fantastic, below cost price on an item they really don't have because they never have to actually 'stock or sell' the product). We will offer a refund if you ever find the exact same item at a lower price (Canadian product in a Canadian store) within 7 days of making your purchase. We need notification in writing and any supporting documentation via e-mail or Canada Post mail. This is more than fair and allows our customers to shop knowing that they are receiving a fair price. Whatever the situation - if you have seen an item cheaper at our competitor or if you feel that we have priced something too high, tell us and we'll do our utmost to rectify the problem. Camera Canada wants to keep our customers happy and satisfied. We take community involvement very seriously and are proud to support several organizations including the Salthaven Wildlife Rehabilitation and Education Centre. Salthaven is committed to the care and rehabilitation of sick, injured, orphaned or otherwise compromised wildlife. Their goal is to return healthy animals to their natural habitat. Through education they are dedicated to increasing public awareness about and respect for the issues affecting Canadian Wildlife. You can read more about this wonderful organization at www.salthaven.org.